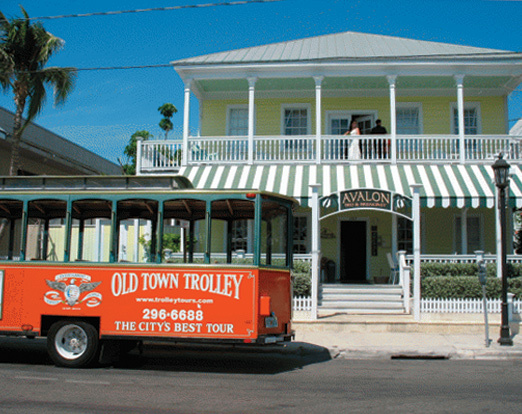 A Key West Bed and Breakfast Key West Bed and Breakfast Welcome to Avalon B&B, your Key West Bed and Breakfast, located on the quieter end of historic Duval Street, just one block away from the Southernmost point in the continental USA and only steps away from the beach. The new Key West Butterfly & Nature Conservatory is just across the street, and attractions such as the Hemingway House and the Lighthouse Museum are just a leisurely stroll away. Avalon B&B is a lovingly restored Victorian house built in 1895, boasting high colonial style ceilings and decorated with a tropical elegance and homey atmosphere. Relax and read a book from our exchange library in one of our poolside Adirondack chairs, or enjoy a glass of wine on our front porch overlooking the quieter end of Duval Street. Enjoy our tranquil island atmosphere but know you are just minutes away from the hustle and bustle of Duval Street's nightlife and the famous Sunset Celebration at Mallory Square. Queen in the Main House Decorated with elegant style and comprising amenities such as mini refrigerators not always found in a small inn, these rooms are perfect for couples looking to get away from it all. Located on ground and second floor. Please ask when making reservations if you have a preference. Two Queen Size Beds Also located inside our main house. The rate for this room type is for up to 4 people. Perfect for families or two couples. They all boast high colonial style ceilings and ceiling fans. Well-behaved children are welcome. Small Queen Room Located at the rear of the main building, these rooms open up by the pool deck. Although smaller than our rooms in the main house, they all have the same amenities, including mini refrigerator, private bathrooms, and canopy beds. Ideal for those on a budget or our single travelers. Avalon Bed and Breakfast Key WestAvalon Bed and Breakfast Key West King Rooms Located on the second floor of our main building these elegant rooms feature a plush king size bed and private bathrooms with glass block accents. Perfect for a romantic getaway or anniversary celebration. The Honeymoon Cottage An elegant King size bed awaits you in our private cottage located behind the main house. Tastefully decorated and airy, comprising a sitting area with queen size sleep sofa, the cottage opens up onto our pool. Complete with bathrobes for use during your stay with us. Relax and enjoy a cool drink while sitting on your front porch. Perfect for those who want to pamper themselves with a little more space and privacy.